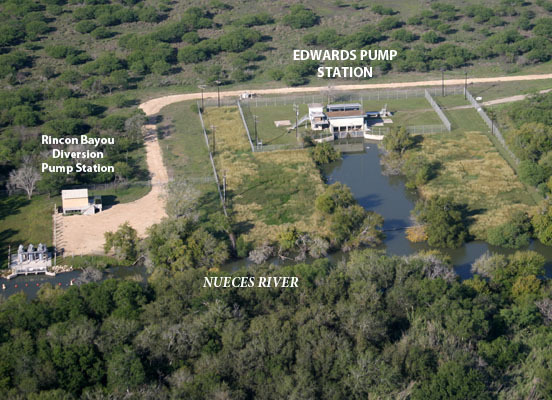 2 EDWARDS PUMP STATION - The process of making drinking water starts 23 miles to the west where the Water District has a pump station to take "raw" water from the Nueces River at the Calallen Pool. Lake Texana water is delivered through the Mary Rhodes Pipeline (CC) and the Gene Dressen Pipeline (SPMWD). The City of Corpus Christi's Rincon Bayou Diversion pump station (left) allows river water to be delivered efficiently to the Nueces Delta to benefit the estuary.